The ES8243A Arc 4 is one of Panasonic’s best-selling electric shavers, offering a great blend of performance and costs. It’s fitted with a powerful motor, sharp blades and has rock solid build quality. And to make the deal even sweeter, it is also quite reasonably priced considering that you’ll be getting a lot of shaver for your money. Read along for our in-depth Panasonic ES8243A review and find out if it’s the right shaver for you. 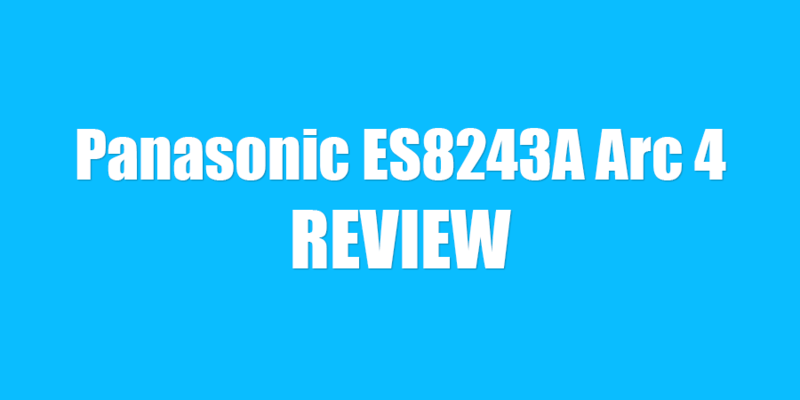 The Panasonic ES8243A Arc 4 can be considered an upgrade to the already excellent and highly popular ES8103S from the Arc 3 line. The shaver was beefed-up by adding a fourth cutting element to the shaving head, called a finishing foil that should cut the stubble really close to the skin. 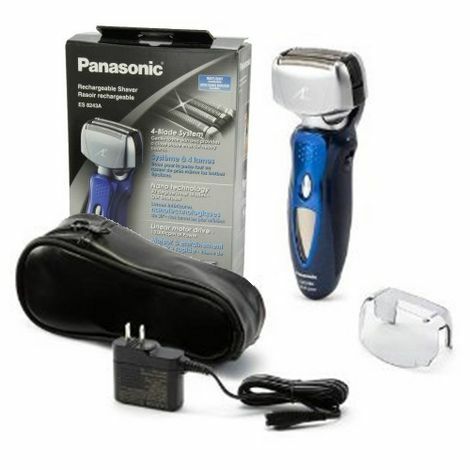 This razor features the same excellent high-speed linear-drive motor found on may other Panasonic models. Even though Panasonic managed to bump the speed up to 14 000 CPM (cycles per minute) in some of its other more expensive shavers from the Arc 4 family, 13 000 is still enough, especially when considering that other manufacturers don’t come close to those numbers. 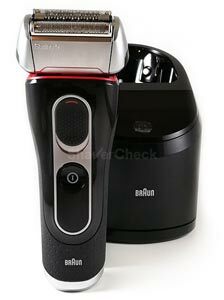 I’m talking of course about Braun that uses 10 000 CPM units even for the high-end shavers like the Series 7 or Series 9. Having a powerful motor also has a minor downside, meaning that this is not the quietest foil shaver out there and the foils can get a bit hot after prolonged use. However, the advantages outweigh these shortcomings. Gimmicky name aside, these blades that have been around for a while in Panasonic’s shavers are among the best. The aggressive 30-degree bevel ensures a very efficient cutting action, with no pulling or tugging. The shaving head, as the name Arc 4 suggests, is made out of 4 cutting elements. 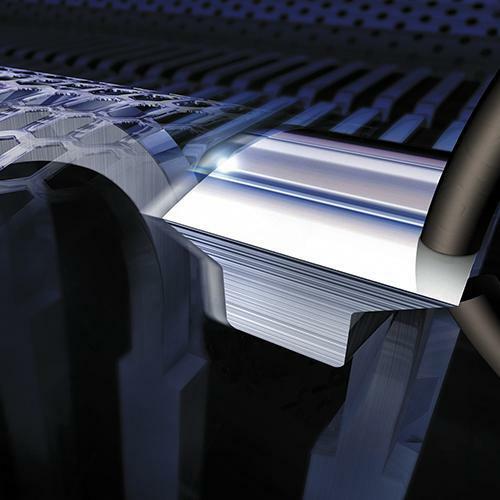 The outer two are the typical inner blades that oscillate behind a foil screen and are responsible for the bulk of the shaving action. The ones in the middle are integrated into the foil block and work together with the outer ones to shave more efficiently. One of them features a special design, with long slits that will trim down the longer hairs to a more manageable length and are then cut close to the skin. We’ll see later on in the review how well it actually performs. 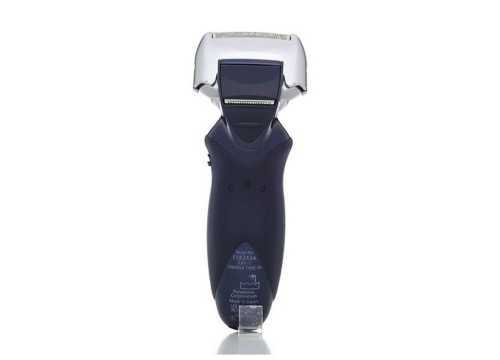 The shaving head of the Panasonic ES8243A can move back and forth and also from left to right, supposedly ensuring better contact with the skin and making it easier to follow the contours of the face. The foils are also slightly curved for the same reason. You can lock the head into a fixed position with a switch located on the side of the razor. Compared to other shavers, the ES8243A is lightweight and well balanced. It is also very comfortable to operate and the rubberized inserts on the sides and back ensure a very secure grip. As far as aesthetics go, I was always a fan of the futuristic, hammerhead-like design of Panasonic razors. This one is no exception and it looks excellent in my opinion, although not as classy as the top of the line Braun or Norelco shavers. Build quality is also excellent and everything feels solid and robust, despite an all plastic build. The razor can be fully charged in about one hour and should provide enough power for 45 minutes of use. Nothing out of the ordinary, just the normal battery life you would expect from a quality shaver. As it’s the case with all the electric shavers that can be used for wet shaving, you can’t use the ES8243A while charging. This is a safety precaution and we won’t consider it to be a negative aspect anymore, especially since there’s a 5-minute quick charge option. The LCD display shows the remaining battery in percentages in increments of 10%, but also the duration of the shave in minutes and seconds. This is very handy in my opinion and I wish more electric razor would have this feature. The automatic voltage conversion adapts to any voltage between 100-240v, so you can also use it when traveling abroad. As you probably know, the shaver doesn’t come with a cleaning station. Given the fact that the ES8243A is fully waterproof and dead easy to clean manually, you won’t really feel the need for an automated cleaning system. Cleaning only requires a bit of liquid hand soap and warm tap water. To ensure proper cleaning, the razor features Panasonic’s Turbo cleaning mode that should be used when the faucet symbol appears on the LCD display. To activate the Turbo mode (which bumps the speed from 13 000 to 17 000 CPM) you must press and hold the ON/OFF switch for more than 2 seconds. It will automatically stop after 20 seconds. And now let’s get to the most important part of our ES8243A review, the actual shaving performance. 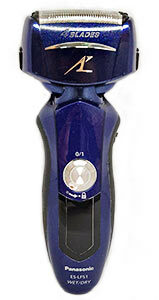 The ES8243A is advertised by Panasonic as a one pass shaver. Although in practice you’ll find that there simply isn’t such a thing, this razor will indeed deliver an excellent shaving experience. The massive, 4 cutter shaving head can cover large areas very quickly. This, coupled with a powerful motor and sharp blades make the Panasonic ES8243A one of the most capable electric shavers in this price range. The closeness of the shave will satisfy almost everyone, being almost on par with what you’ll get from much more expensive shavers like the Arc 5. The most impressive thing about it is just how fast and close it shaves, especially when used on a shorter beard. Men with coarse facial hair will particularly benefit from the powerful motor and the sharp blades. Using a pre-electric shaving lotion will further improve the comfort and the performance of the shaver; it will also help straighten the hairs that stay flat on your skin because it can struggle with some of those, especially if they also grow in different directions. 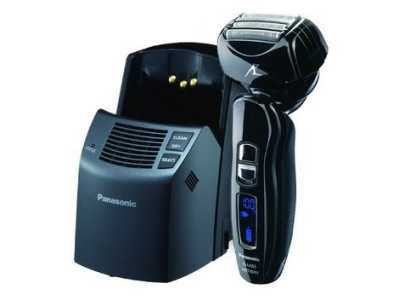 The Panasonic ES8243A can also be used for wet shaving, where it simply shines. It doesn’t get clogged with shaving cream and you can easily rinse it with water if you need to. I find the closeness and particularly the comfort much better when used with shaving cream. 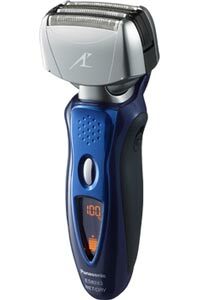 And this leads us to one of the potential downsides of the ES8243A — it’s not the most comfortable shaver in this price range. If you don’t have sensitive skin you’ll probably be just fine; otherwise, a Braun Series 5 will likely be a better option. Finally, there’s the popup trimmer; while it does perform well and works excellent for basic grooming, it has the same problem as most Panasonic shavers. The placement, together with the fact that the shaving head is so big means that you simply can’t see what you’re doing. One thing that seems to work is to have the shaving head and the inner blades removed before using the trimmer. Of course, one downside of having a large shaving head is that it can be somewhat unpractical for detail work, like shaving the base of your sideburns, upper lip area or around a goatee. This is a thing to keep in mind for some men, but I think the benefits you get from a large shaving head far outweigh this shortcoming. As for other negative aspects of the shaving performance, there is the always tricky neck area, that requires multiple passes to get a close shave, especially if you have hairs that stay flat on your skin. Shaving more often can reduce this problem to a minimum. Changing the blades and foil of your shaver must be done once a year. Unfortunately, the replacement parts for this shaver are a bit pricier than what you would expect. I recommend changing both the foil and inner blades as you won’t get the best out of your shaver by using a worn part together with a new one. This shaver has to be one of the top picks for men with medium to coarse facial hair and it works particularly well for shaving daily. However, you can get away with using it every other day or even more if you have a slower growth and still get excellent results. If you suffer from post-shave irritation, razor burn and have a history of “bad shave days”, the Panasonic ES8243A can also be a viable option, especially if you use it with a pre-shave or shaving cream. Given the fact that it is a solid, all around great performer for both dry and wet shaving, you can’t really go wrong with this one. In terms of value for money, you will be hard pressed to find a foil shaver in this price range that performs a lot better. As mentioned throughout this review, the Panasonic ES8243A Arc 4 is definitely one of the best electric shavers in this price range. However, one of the (few) complains about it is that you can’t have it with a cleaning and charging station. If you really must have one, there is another shaver from the Arc 4 line that comes with one, the ES-LA93-K. I would personally skip the cleaning station, but if you really must have one with your Panasonic shaver, the ES-LA93-K is a good option. For men with very sensitive skin, a Braun Series 5 is more comfortable out of the box. They are also better with longer, flat-lying hairs. There are several variations available, but all of them are generally more expensive. The Series 5 5090cc that I reviewed here is probably the best in terms of value for money as it also comes with an automatic cleaning station. And unlike Panasonic shavers, the ones from Braun are more difficult and fiddly to clean manually. So you’ll definitely want the cleaning station as well. Finally, there’s what I currently consider to be the pick of the Arc 4 line. It’s called the ES-LF51-A and you can check out my review of it here. It has a slightly more powerful motor than the ES8243A, a slightly smaller shaving head (even though it features the same 4 cutting blades) and comes with a travel lock as well. And considering that it costs pretty much the same as the ES8243A, this one would be my pick. I have owned my ES8243 for several years and I like it very much. I do have one issue, and that is, that there is one icon that appears on the display that is not mentioned in the manual, hence I do not know what it means or how to clear it. Nowhere on the Internet have I found a complete explanations of the icons. This particular icon shows the shaving his with two curved arrows circling it. the ES8243A reviewed here can be successfully used for shaving the head as well. I currently do not have this particular model in my possession anymore, but based on the measurement of other similar Panasonic shavers, I would say that the length of the display is little over 3cm and width is around 2cm at the top. What’s the difference between model es8243 and model es8243A? There isn’t any difference between the actual shavers. Both ES8243A and ES8243 refer to the same product. Depending on where you buy it (America, Europe etc.) it may be available under several names. I always enjoy your reviews and would like to ask a question. Are there any differences between the ES8243A Arc 4 and the ES- LA63- S Arc 4? Is it the same buying one or another given that the ES8243A Arc 4 is less expensive and seems a real bargain? Thank you for your comment. There are a couple of differences, but I wouldn’t consider them significant. If you can get a great deal for the ES8243A, my recommendation would be to just go for it. The ES-LA63-S has a second vibrating motor inside the shaving head, but I didn’t notice an improvement compared to other Arc 4 models that don’t have this feature. The motor powering the ES-LA63-S is slightly more powerful at 14 000 CPM compared to 13 000 CPM, but again this is negligible in the real world. Performance-wise I think you’ll be happy with either of the two. thanks for your reply. The difference I found is 20 dollars so it’s not that much: 79.99 vs 99.99 for the ES-LA63-S so I think I’ll get the latter.